The flipside to this though, is that it's increasingly hard for DJs to stand out - since cutting and chopping skills that once took years to learn are now available to anyone with the latest controller, how are you supposed to make an impact? Assuming you can't afford the obligatory lasers and light show, your best tactic is to be playing tracks nobody else has. For years DJs have been creating edits and bootlegs in order to give their sets unique impact and, with the warping and sampling tools of modern DAWs, it's quicker and easier than ever to get creative. Want to beef up your favourite old Funk B-side? Rearrange a track to make it easier to mix with? Or stick a classic vocal over your latest instrumental? We've got you covered. 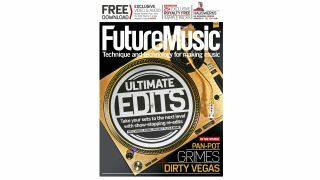 Head for this issue's cover feature, complete with videos, tutorial files and samples to download at: http://vault.futuremusic.co.uk. Distorted Drums - Crunchy, fuzzy and filthy hits and beats. From beefed-up kick drums to saturated snares - give your beats some grit! Acid House Essentials - Heavy beats and resonant bass loops. We break out the 303 to give you all you need to create Acid classics. PLUS: Access the FM sample archive - UPDATED! Download the 'Archive' packs and get over 8GB of loops, hits and instruments from our back catalogue of high-quality and royalty-free samples. From vintage synths and drum machines to esoteric instruments and FX - think of it as our best of. All the samples you need to create great music!